Update: Aloha IZ fans! Good news, the technical issues we were experiencing have been solved! We apologize for any inconvenience you may have experienced. 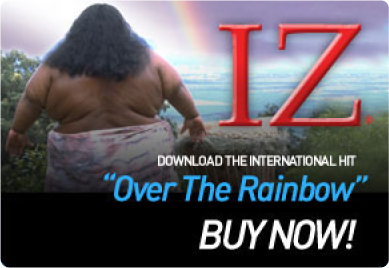 Check out IZ’s Facebook fanpage, where you can get the free download (just click the tab in the menu on the left that says “Free Download”), purchase IZ merchandise, and receive updates about IZ’s music! Also, feel free to add Mountain Apple Company on Facebook, for daily updates about other talented Hawaiian music artists! It was an honor to be able to listen to Under The Rainbow on YouTube. Every time I hear it, it brings tears to my eyes. Mahalo. E ho’omaha me ka maluhia, IZ.